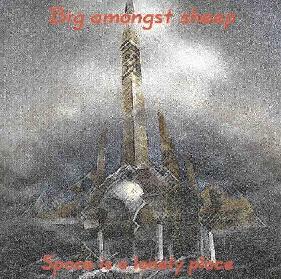 Big Amongst Sheep - "Space is a Lonely Place"
This band must be one of spacerock's best kept secrets, as their three recordings (the LP "Terminal Velocity" and EP's "Astropop" and "Hearts on Fire") now reissued on CD-R (ltd. edition, no doubt) all date from the dark ages of space rock awareness. The quintet's style falls into place amongst Hawkwind (e.g., "Levitation") and Eloy of the same period, with rich melodies and symphonic-style keyboards. Hence, Big Amongst Sheep's twin synth masters (Judith Bone and Gavin Bull) are key to the fullness of the sound. Stuart Macfarland's guitar leads and solos are crisp & clean, and nestle into the open cracks rather than jutting out over top of the remaining instruments. Ian Bone's vocals are strongly-delivered, and are oddly accented and make it difficult to determine his ethnic heritage. Big Amongst Sheep is labelled as a UK-band, though I wonder if the Bones are really Scandinavian. "Dunmail Raise" is one of the strongest tracks, and benefits greatly from the flute soloing by none other than Nik Turner himself. Two other tunes ("Stone Circle" and "Radioactive Daffodils") also find Turner playing his saxophone in a quite favorable (i.e., less-than-honking) fashion. "Terminal Velocity" on the other hand, is one for fans of the ICU-era Nik, a punkish affair with a touch of the 'squawks.' Don't get me wrong...I found it a bit of fun. "Out of this World" is truly a first class song, and sounds very much like DarXtar. "Tranquility Zone" is one of several tracks when Ian Bone offers some sci-fi spoken passages that are true to the Hawkwind form, and a welcome addition. There's a lot of music here (16 tracks totalling over an hour), and most of it is high quality material. A shift from more symphonic material to a 'punkier' (but not-so-aggressive) style is evident through the album. And since "Space is a Lonely Place" compiles music from over a three-year period, I can see that the band went through a bit of evolution. It's obvious from the "Astropop" chorus..."Big Night Out in the Big, Bad Universe" that after their earlier, more serious work, Big Amongst Sheep were ready to party in space. Time for that Pan-galactic gargle blaster, then. In fact, make it a double.